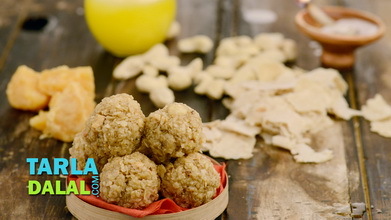 This three-in-one treat is a typical Rajasthani treat. 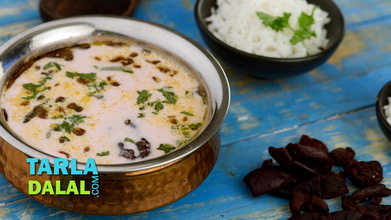 The Rajasthanis specialise in serving sweet and savoury dishes in combinations that steal the heart and delight the taste buds. 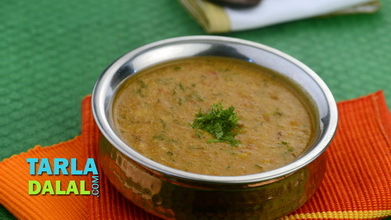 A platter of semi-sweet Churma, spicy Dal and deep-fried Baati, is one such traditional combination. 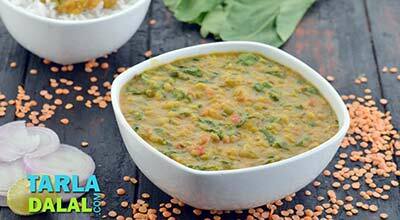 Fresh baatis drowned in piping hot dal is a perfect accompaniment for churma. 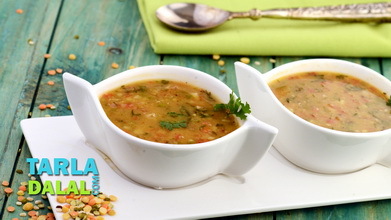 If you have ever been to Rajasthan in the winter months, you will know that this combo is a wonderful way to warm yourself up on a cold day! Shape each dough portion in the shape of your fist and press with your fingers in the centre of each portion to make an indentation (as shown in the images 1 to 3). Add the almonds, cardamom powder and powdered sugar and mix well. Keep aside. Clean and wash the dals. 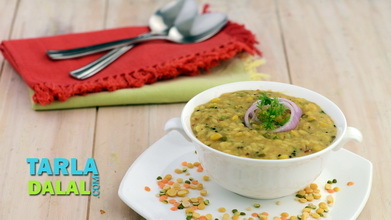 Combine the dals, 4 cups of water and salt in a pressure cooker, mix well and pressure cook for 3 whistles. When the seeds crackle, add the garlic paste and onions and sauté on a medium flame for 2 to 3 minutes. 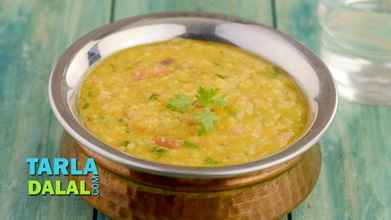 Add the cooked dals (along with the water) and little salt, mix well and cook on a medium flame for 2 to 3 minutes, while stirring occasionally. Boil enough water in a deep non-stick kadhai, add all the baatis into the boiling water and cook on a high flame for 15 minutes, while turning them occasionally. Drain and allow them to cool completely. Heat the ghee in a deep non-stick kadhai, add 4 baatis at a time and deep-fry till they turn golden brown in colour from all the sides. Repeat step 7 to deep-fry the remaining 4 baatis in one more batch. Drain on an absorbent paper and keep aside. 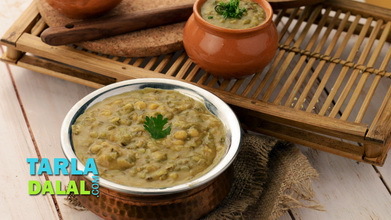 Arrange 2 baatis on a serving dish, break them into pieces and pour 1 tbsp melted ghee evenly over it. 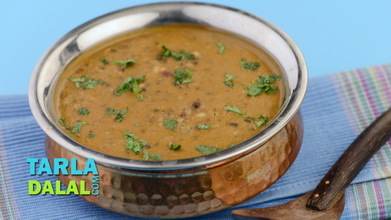 Pour ¼ of the dal evenly over it. Sprinkle 2 tbsp of onions and ½ tsp lemon juice evenly over it. Repeat step 2 to make 3 more servings. Tarla Dalal Thanks Shaveta for your feedback. Glad you liked the video. Happy cooking. 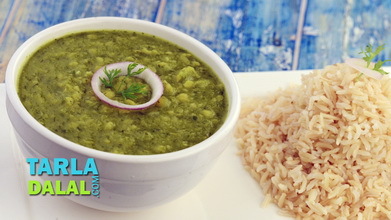 Tarla Dalal Hi Shaveta, We are very happy to know you have loved the recipe. Do try more and more recipes and let us know how you enjoyed them. Happy Cooking ! !